Last night I tried Jewellery making for the very first time at the Sussex Jewellery School. I didn’t even know we had a Jewellery school here in Eastbourne until a few weeks ago. I found out about it via Facebook of all places! 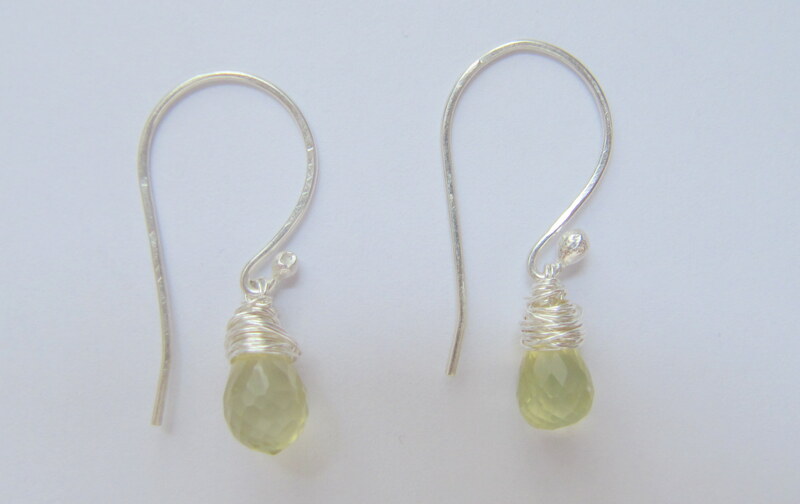 The workshop was entitled: Gemstone Earrings Intensive 2-hour class (wire-rapping with a little basic silversmithing). The course is run by Sarah Jane Whittaker. This class is suitable for the complete beginner and all materials are included in the price of the course. At the time of booking, there was a special offer via Groupon which was promoted by Visit Eastbourne on Facebook. Prior to the course, I was sent detailed information about the course, what to expect and what to wear. On the evening of the course, all of our supplies and equipment were neatly laid out at our workstations. Sarah took us through the details of the class for the evening and went through all of the Health and Safety issues. A jewellery workshop is a potentially dangerous place. Some of the tools are very sharp, there are chemicals, and you play with fire. After making sure we understood the format of the evening and Heath and Safety issues, we were ready to make our earrings. First we practiced on a pair of turquoise beads with copper wire. Sarah explained the procedure and then showed us how to do it in stages. The first stage was wrapping the wire around the bead. If you haven’t done it before, it isn’t as easy as Sarah makes it look. It isn’t complicated, just fiddly. As with anything, it takes practice. Fortunately, our wrapping wasn’t meant to be perfect. We first used a thicker copper wire just to get the hang of wrapping, and then we tried it with a thinner wire to prepare us for using the silver. The copper wire was then discarded and we were ready to wrap our gemstones with silver wire. The gemstones given to us are semi-precious and I was allocated a pair of small yellow citrine beads which were chosen randomly. The smaller the bead, the more challenging it can be to wrap as the holes drilled in the top are very small, and it can be quite easy to break the tips off. Nice! Actually, they are really pretty. The silver wire needs careful handling as it is softer than the copper and can break off if too stressed. I managed to wrap my stones nicely, but not too neatly as we were shown. The next stage involved making the hooks. This stage requires careful handling of thicker wire, pre-cut, that we had to straighten before creating a bobble at the end. This is where we get to play with fire! We used crème brûlée burners for this. I never used one before. Sarah demonstrated the procedure and then worked with us one at a time. I have to say that this part was probably my favourite as I thought it was extremely cool how one can turn a straight piece of wire into a piece with a little ball on the end. The heat of the flame makes the wire move up on itself to create a little ball. I’m sure this part could lose its appeal after a while once you’ve made quite a few. After we made our bobbles, we then soaked our hooks into an acid bath to remove the tarnishing that occurred through heating the metal. The bath removes the tarnish and results in the silver having a white coat which is then brushed with a wire brush to bring up the shine of the silver again. How do I rate the course and the tutor? If you have never done any jewellery making before, this class is a very good one to start with. It is only two hours. There were only three of us this evening, so we received a lot of attention and the time passed quickly. All materials are included in the price and you come away with something you can use. The tutor is very organised and explains how to do everything prior to demonstration and why. Sarah is very knowlegable, encouraging and positive. I really like her. What I liked about the course: I liked everything about the course. Being a hands-on, methodical person, I enjoyed the whole process of learning a procedure with a finished product at the end. I enjoy working with my hands and making things. Would I do another course? Yes! I learned a new skill in just two hours. The object of all the courses is to provide you with skills to make items at home. If I wanted to, I could make hundreds of little pairs of dangly earrings to sell or give as gifts. I will most likely do a course using silver clay, once I find a free weekend. Tips: Wear old clothes. There are chemicals and fire. Need I say any more? Oh, and bring glasses if you need them for reading. I realised that I need to upgrade my lenses on my glasses. The photo of my earrings show more detail than what I can see at the moment. Although there were plenty of light sources in the room, obviously working in daylight is best. So, what new thing have you tried lately? I have been fortunate to come across some amazing women in my lifetime thus far. It seems that with every new thing I try, there is an amazing woman to be found. I have come across countless amazing women through my scuba diving. (I have been diving for nearly 15 yrs, so it really is countless, and the list is growing in that sector!) I have met the most interesting women through my dancing since I started over 7 years ago. After all, there are more women that dance than men, and while waiting for a dance what else are we women supposed to do with our time? We chat and get to know each other! Since I started blogging and using Facebook, women have been extremely supportive and some have become ‘real’ friends. It is amazing how having a common interest can bring people together. I have learned so much from women who have interests and write about them. For example, I love dancing Argentine Tango. When I started blogging, I read every blog about Argentine Tango that I could find. Ultimately, I settled on a few that I felt were pertinent and interesting and read their stories. Stories of women who wanted to change their lives and had a passion. There were challenges and pitfalls along with the good stuff. What got to me was their honest and open expression of feeling about their journey that they shared on the blogosphere. I have cheered them on when they were feeling down, congratulated them on their successes, commiserated, you name it. The upside was they were there for me too when I shared on the blogosphere. I have also benefitted from women who are into DIY or are good at finding a piece of junk and making it into something beautiful. Some of these women are so wonderful that they even post step-by-step instructions on the how-to. Although I have been doing this type of thing for years, there are times that even I get stuck for an idea or need to know how a particular product is going to work. The creativity of some of these women is mind-blowing! Women write blogs on everything. So whatever you are interested in, I am sure there is an amazing woman out there who is writing about it. You just need to search the internet and find her. I have so many interests I could spend days on the computer reading blogs about what I like!